With the recent completion of our remodel in Dallas, I’m thrilled to share the design process and long awaited photos with you! 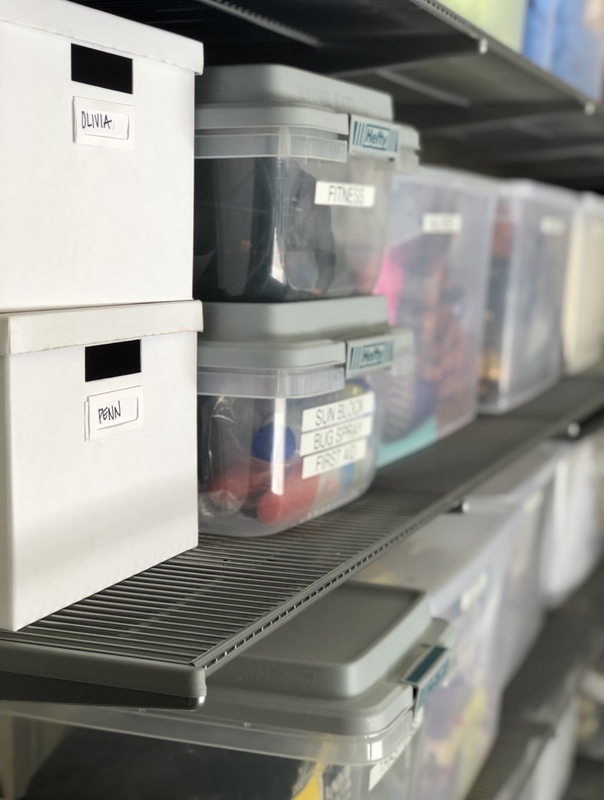 Believe it or not, even as a seasoned interior designer, I still struggle making decisions for myself on something as important as our kitchen. This is where our family not only makes and eats meals but also enjoys after school snacks, crafts, homework, where we celebrate the birthdays of our four children and where my husband I always end the night chatting. I went back and forth for days (weeks! months!) between wanting to keep it classic or do something totally different. 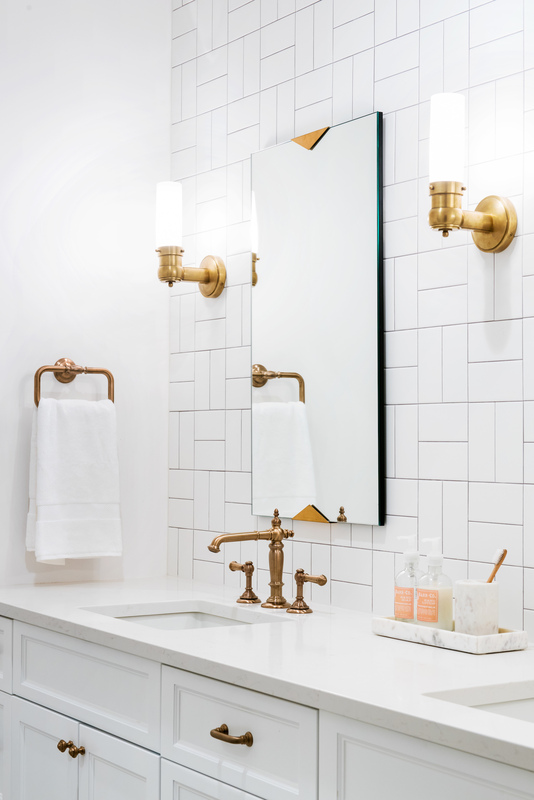 Who doesn’t love coming home to a clean, white space, but I also felt the desire for a never-been-done-before design that embodies the perfect amount of inventive form and necessary function? And then I found IT! 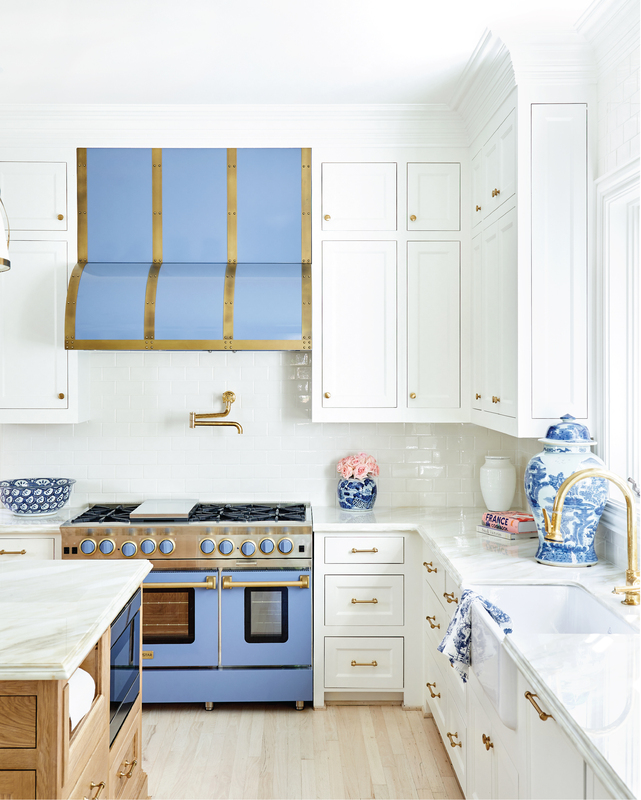 My “pièce de resistance” – a stunning blue range and matching custom hood from Bluestar Cooking and just like that, the entire kitchen came together in my mind. With tons of natural light and a traditional crisp, white aesthetic that glows when the sun hits, our space was invigorated with this fresh, blue statement piece. The classic white dove inset cabinets with a cove recessed panel (Benjamin Moore) are the perfect clean backdrop for the pop of blue and the contrasting warm white oak island. 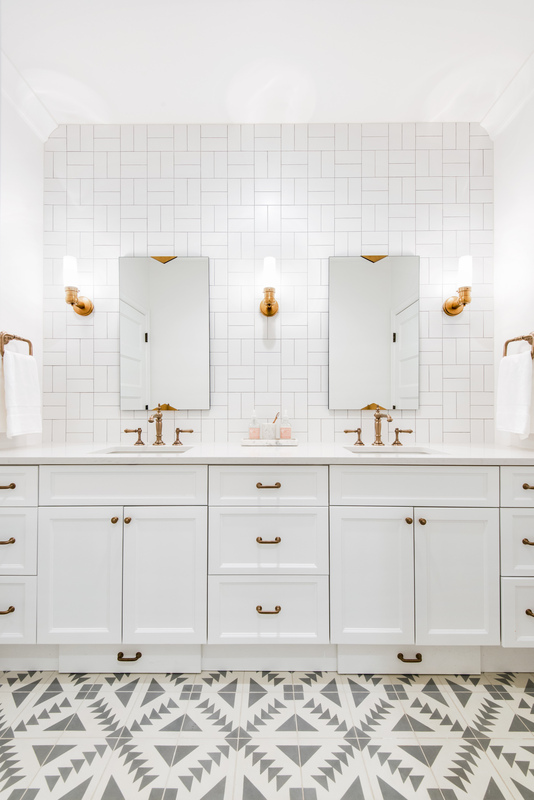 Brass fixtures and hardware add luxe sheen and give warmth with traditional French inspiration visible throughout. The Luccioso marble countertops would provide movement and interest and the casual elegance of a natural white oak island and white-washed floors would give it a solid foundation and natural appeal. And then we have our jaw-dropping blue range and stunning hood that ties it all together, and allowed me to accent with some blue and white porcelain pieces and Navy Madeleine stools from our Bistro Collection. I wanted my kitchen to be both bold and timeless and truly it feels like the kitchen of my dreams. I worked with Bluestar Cooking to choose the perfect range for me in both style and function. I chose the 48″ Platinum series and have been impressed with the simplicity and ease and also it’s superior power. Never before I have I seen a pot of water boil so fast and my cookies are always cooked to perfection. 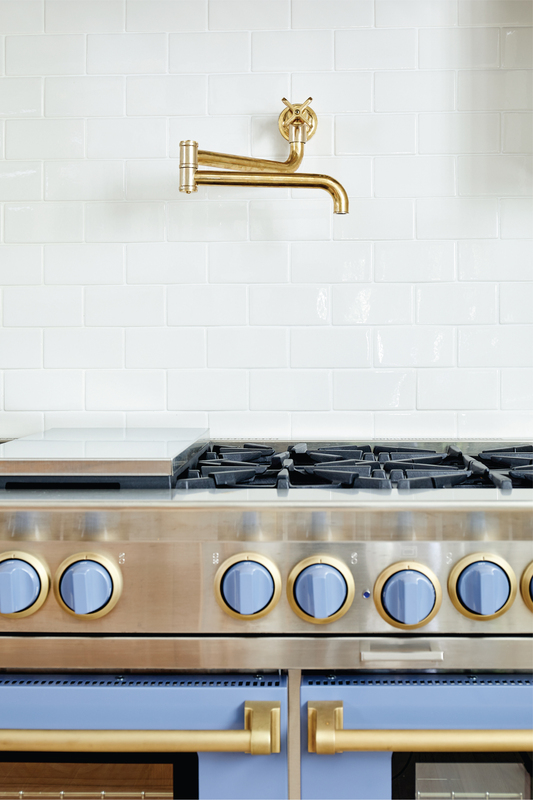 I customized the knobs to be the same Pigeon Blue, added brass accents throughout and a matching vent hood that is modern, luxurious and incredibly effective.I love how the knobs tie in the lighting and hardware throughout to feel luxe and elevated from the typical stainless steel. 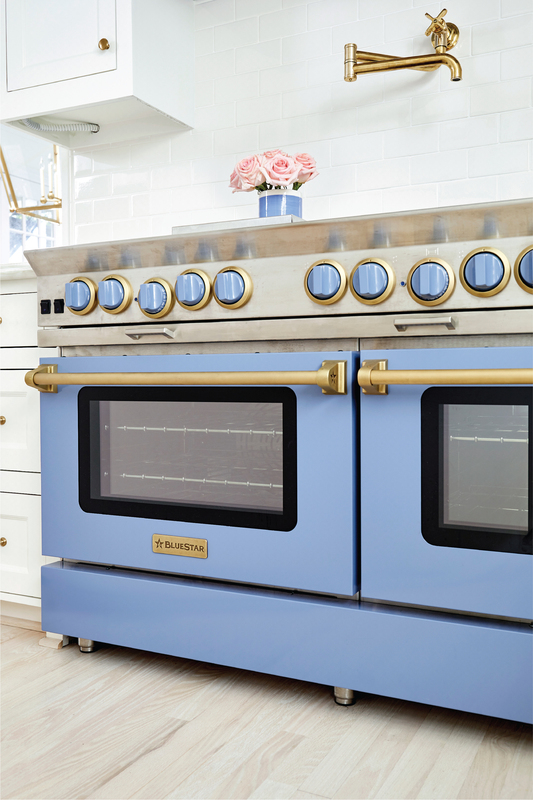 Aside from being a gorgeous showstopper, the Bluestar Cooking appliances are unparalleled in quality! I can’t help but find myself daydreaming about my next meal or cookies to bake for my family in the most comfortable space with the most beautiful appliances I could have imagined. It’s always a treat to see how people put their own twist on our products at Caitlin Wilson Design, often pairing and styling them in unexpected ways that we never would have thought of. We recently partnered with Monika Hibbs, a lifestyle blogger to showcase a few of our favorite pieces from our tabletop collection! Monika created a divine breakfast spread that has us dreaming of a casual Sunday brunch full of sugary carbs, fresh fruits, and friends. 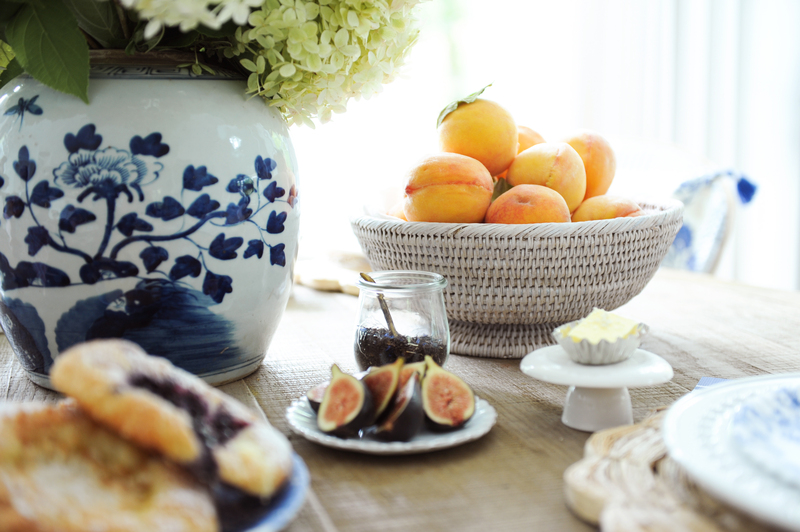 Beginning with a neutral foundation allows you to customize your tabletop to the occasion. In Monikas’ instance, a sophisticated seasonal brunch was the on the menu. 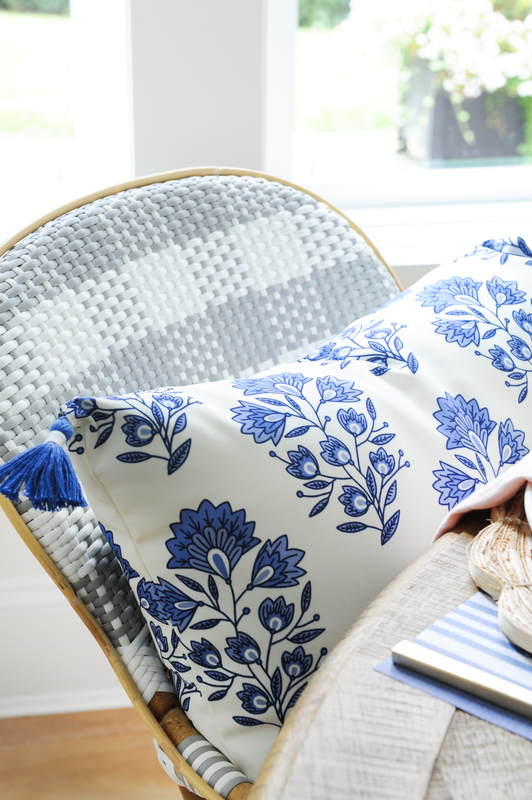 We love how she mixed and matched color, pattern, and texture with our curated collection of plates, placemats, napkins, pottery, and serve-ware. 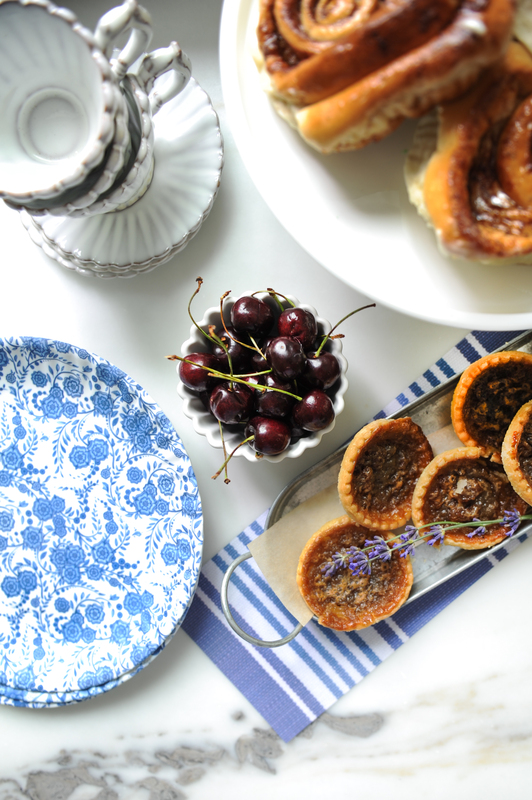 Our favorite blue and white patterned melamine plates featured here are both durable and stylish. 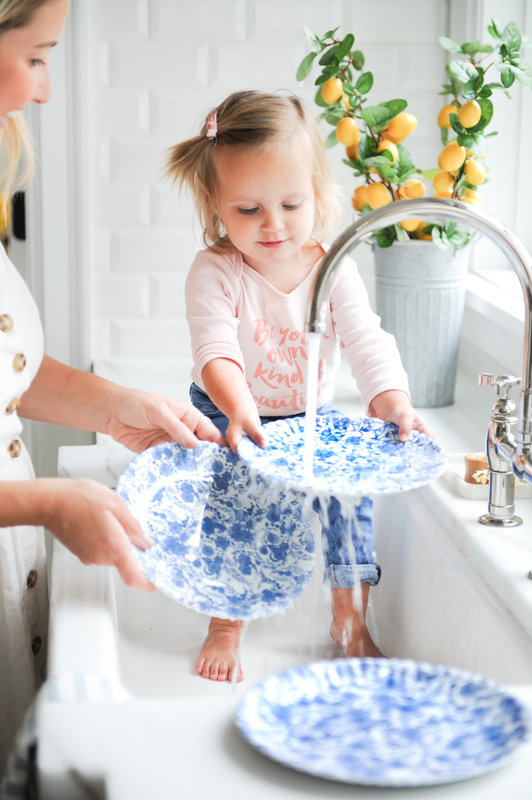 Having little ones running around can be a challenge, and these dishwasher safe, non-breakable plates take just a bit of worry out of meal time. 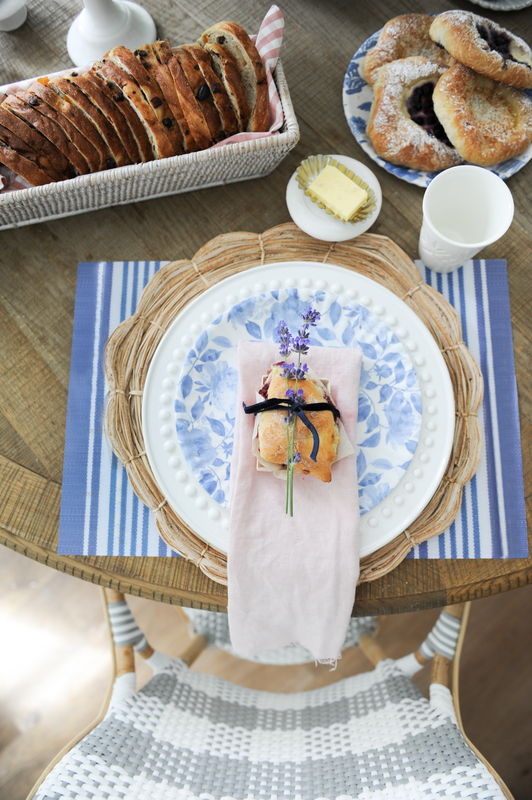 Pair them with our disposable paper placemats for a chic pattern pairing and easy clean up! 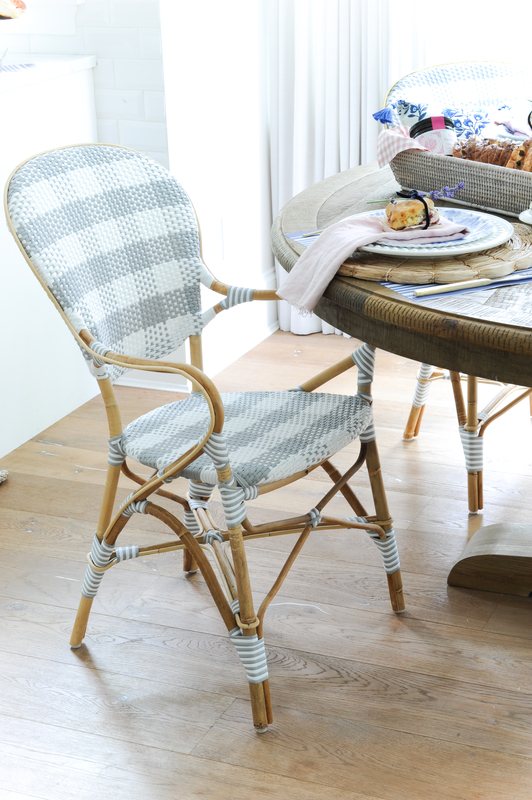 Our rattan table top collection adds effortless style and ease, to help carry food items to and from the table all while adding a textural element to your spread. Lastly, flowers are a MUST! Fresh flowers elevate any occasion, making it feel special and thoughtful. 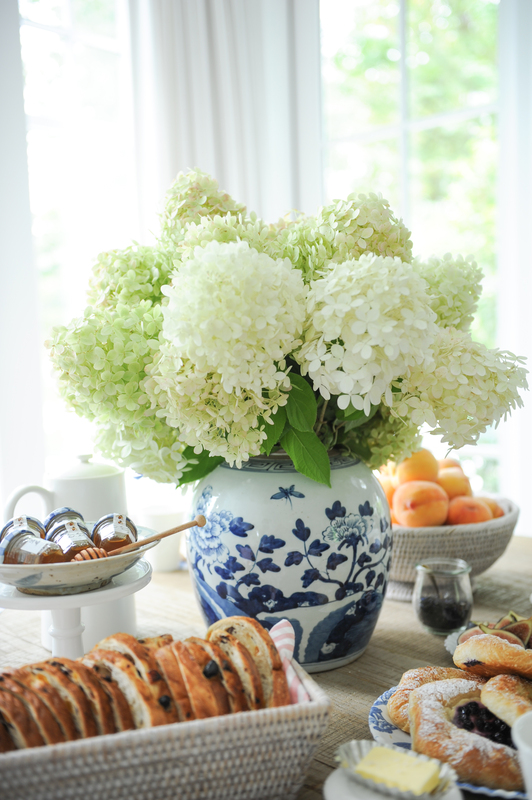 Pop some stems into a beautiful vase for one final touch, and sit back to enjoy your cuisine and conversation. Bon Appetite! A special thanks to Monika and her team for the beautiful images provided. I’m so thrilled to be featured in this month’s Traditional Home as part of the Regional Color Conversation with Pratt & Lambert Paints! As all of you who keep tabs on me know, I’ve had the opportunity to live in so many amazing cities (and now I’m taking on Dallas!) but it’s really Philadelphia and its east coast classic colonial style that has influenced who I am as a designer and my overall aesthetic. So that’s why when Traditional Home and Pratt & Lambert approached me to join the Regional Color Conversation, I immediately gravitated toward the New England colors as representing my signature palette and design style. 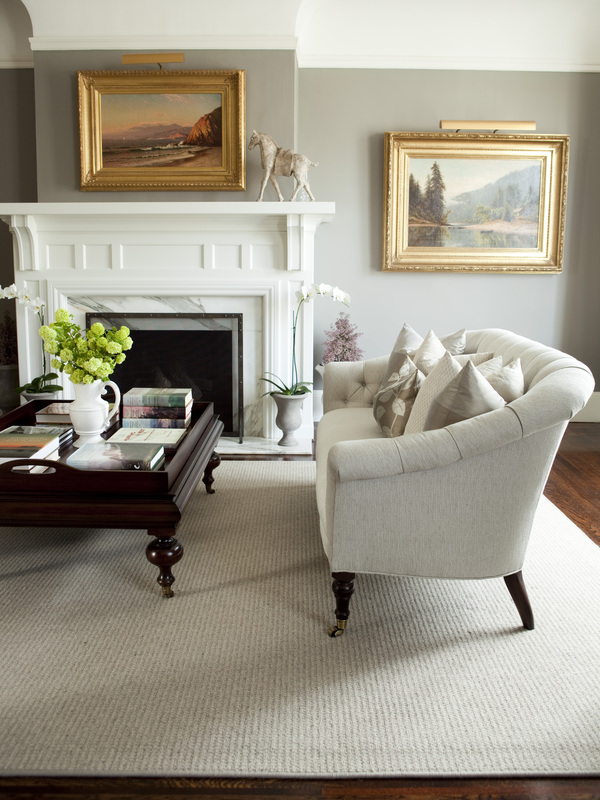 The New England palette is classic yet so modern and fresh all at the same time. 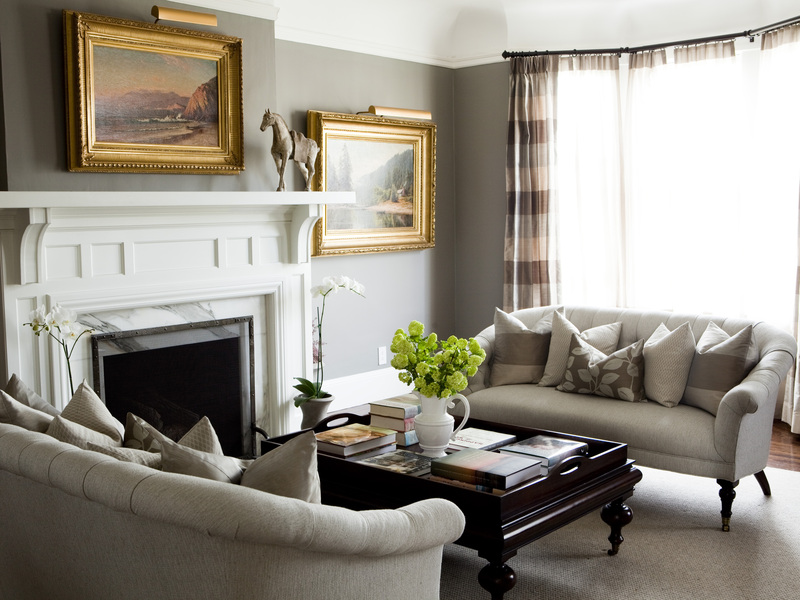 The four colors in the palette – Row House, Harmonious, Tawny Tan and Noble Grey – are designed to work together harmoniously throughout a room, whether as a rich wall color, the pop of an accessory or even the furniture. It’s really these colors you see as a general theme throughout so many of my projects, and especially in the Presidio Heights project. Light greys and sage greens like Row House 408B and Harmonious 316D add a subtle shade that sets the stage for the rest of the design, while still holding their own against accent pieces and artwork. 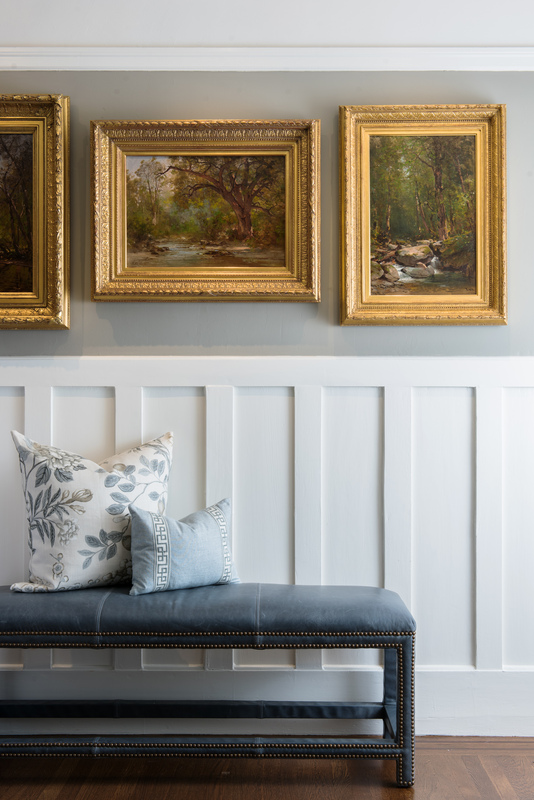 While I tend to use Tawny Tan 327D and Noble Grey 417G as accents brought in through painted furniture or accessories, they can also serve as more statement making walls when you want to go bolder with your color. 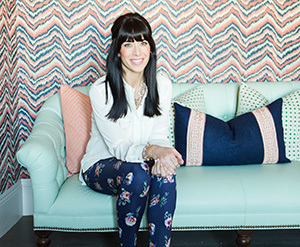 I’ve always been a big believer in using patterns in a space to bring it to life. The trouble is, doing this in a tasteful and timeless way can sometimes be challenging, especially when you’re talking bathroom design! I’m excited to be partnering with Kohler to talk about a trend they’re forecasting will be big in kitchen and bath design in 2017: PATTERN! When I was building my home from the foundation up, I had a totally clean slate. I knew I wanted the bathrooms to have a “wow factor”, but still feel classic and sophisticated. 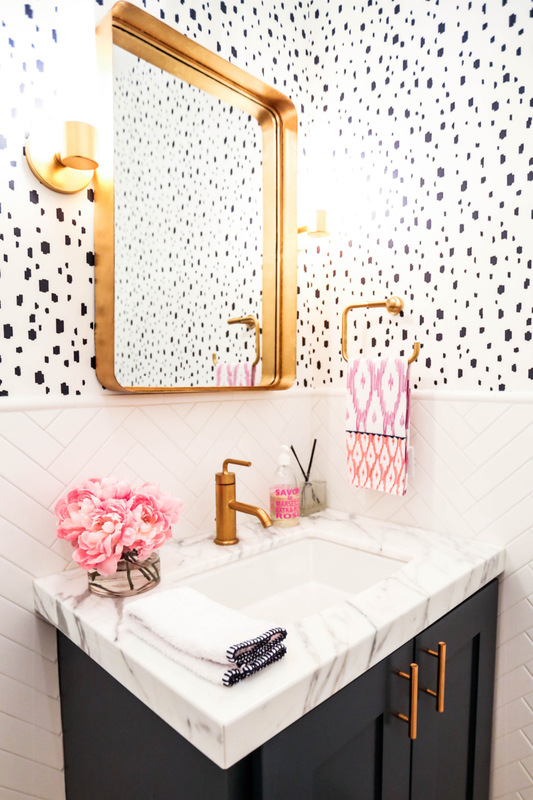 I used pattern through tile and wallpaper to bring life to even the smallest powder baths. Let’s start in my guest bath. 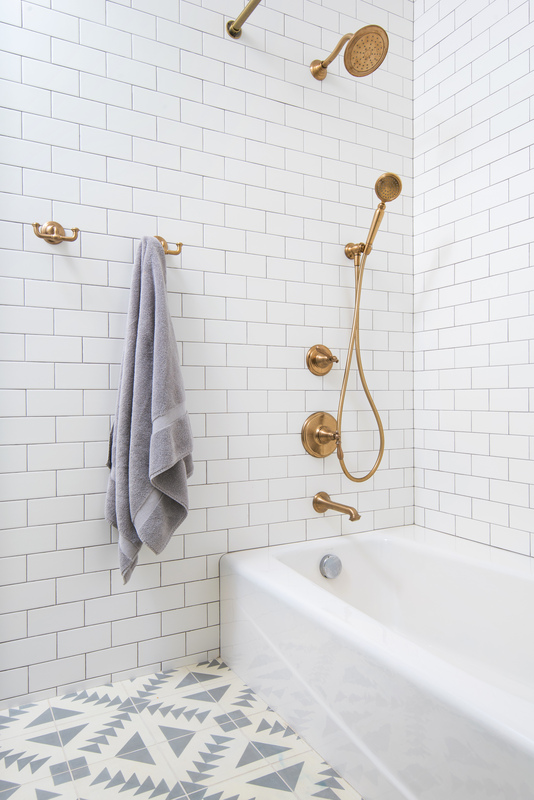 We shared a peek of this shower tile on our Instagram page and it got an overwhelming positive reaction! 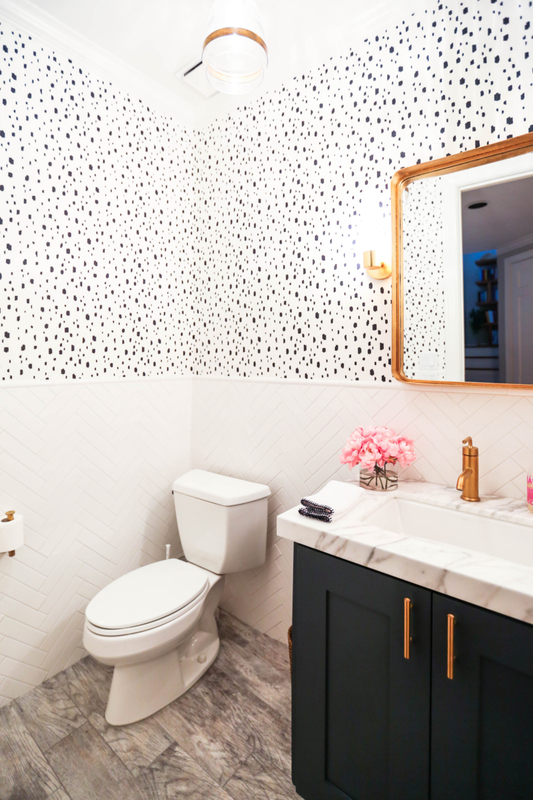 Patterned cement floor tiles have been making waves for quite some time, but using a simple, yet dramatic, patterned cement tile on your shower-surround is a fresh new way to give your bathroom an exciting pop of interest. Because the shower was more visually busy, I kept the floors a bright white in a herringbone pattern for a clean contrast. 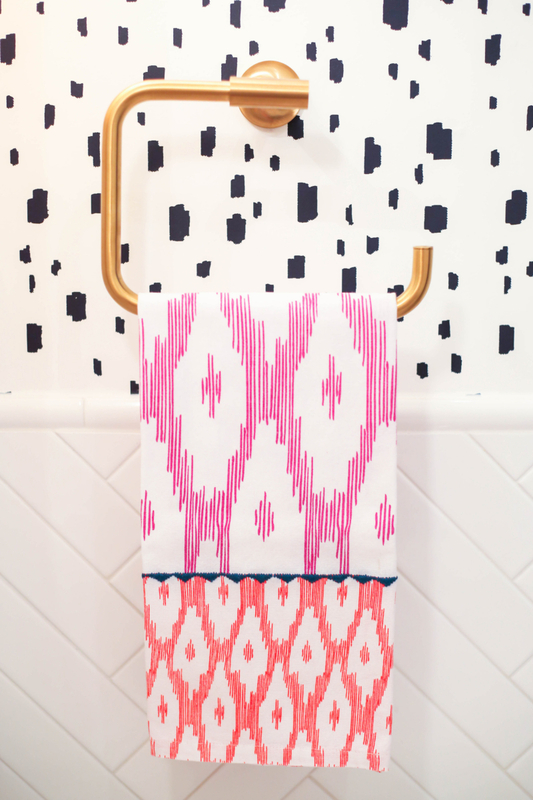 I love the way the two patterns complement each other in scale and color. 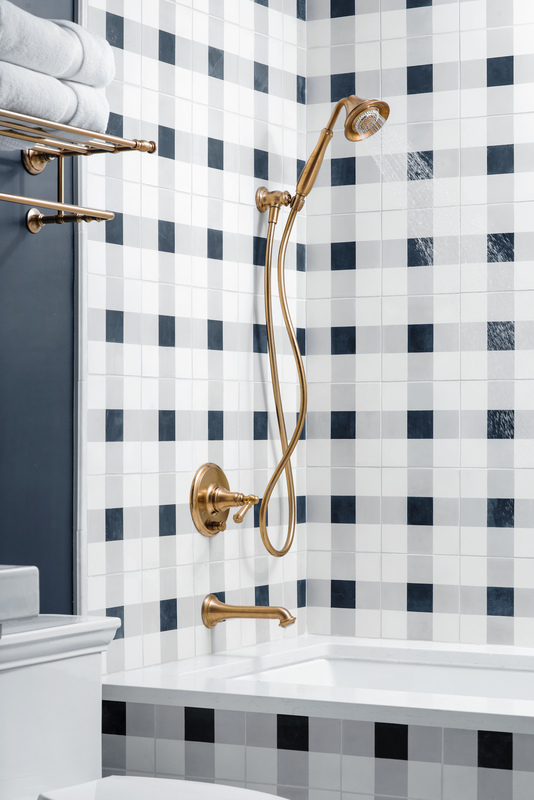 The hints of bronze from the Kohler Artifacts Collection were the perfect touch to give this modern bathroom a classic and sophisticated finish. 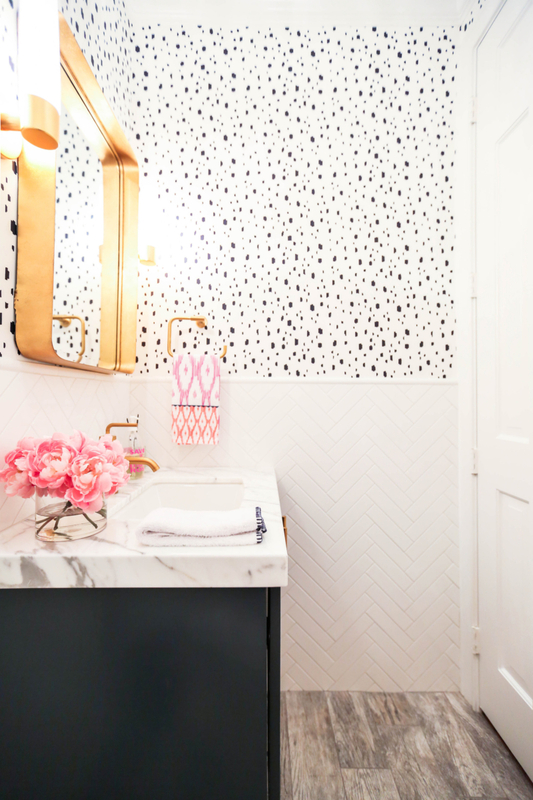 In the shared kids bath I used the opposite combination: a classic subway tile for the shower and a fun patterned cement tile for the floor. 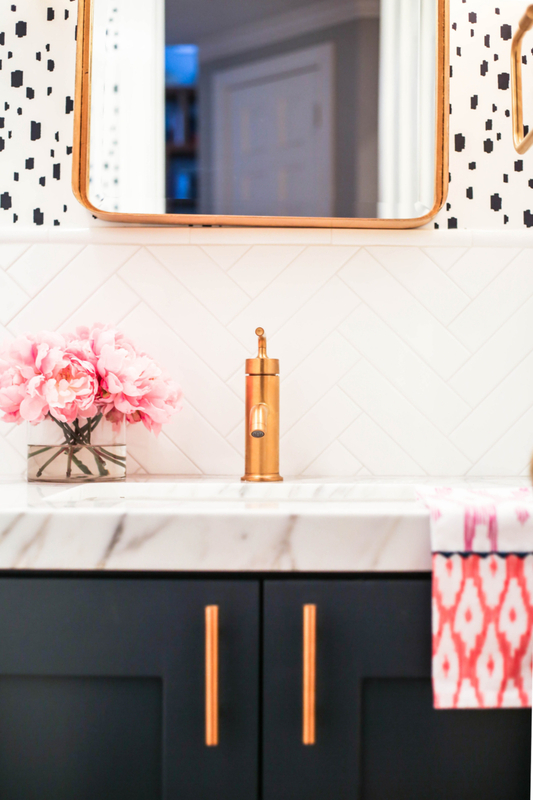 I knew this would be a high-traffic space so the use of patterned floor tiles helps conceal the dirt and grime that is inevitable with three kiddos (and they love the dynamic pattern). I finished the space with a twist on classic subway tile in a basket weave pattern. I always prefer making a statement with a full backsplash from counter to ceiling. 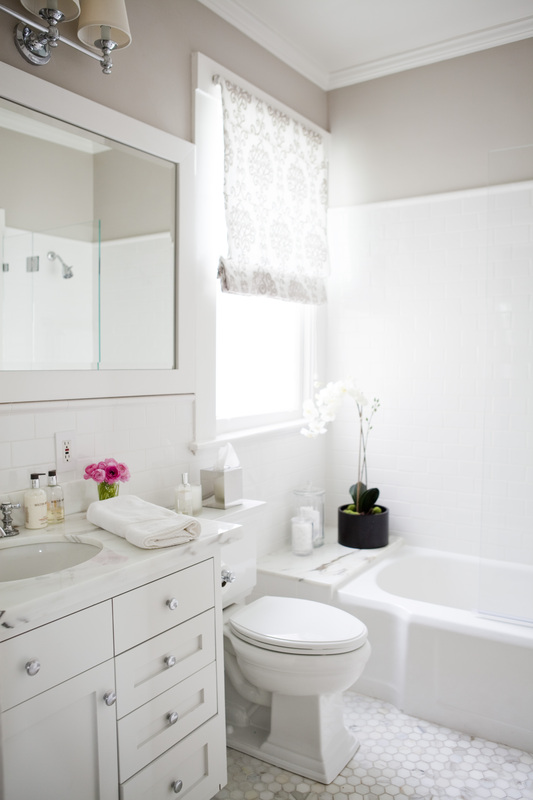 In my master bath, I wanted to create a serene sanctuary. 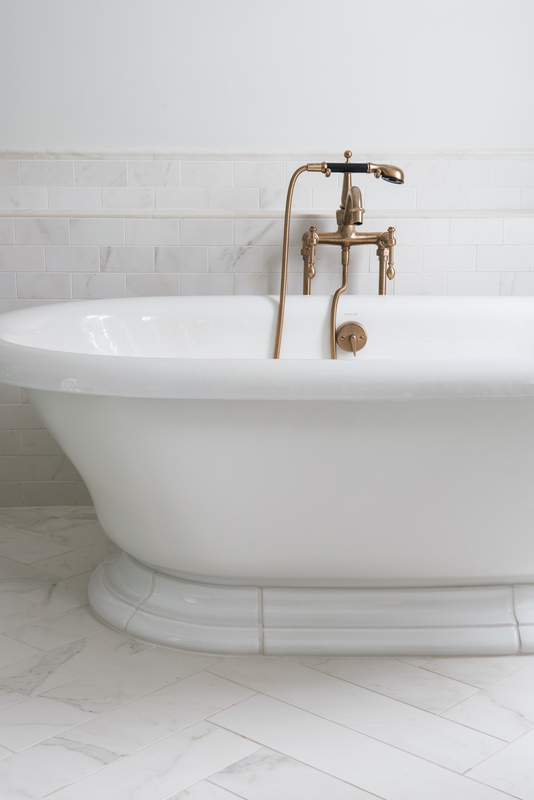 I always imagined it would be the place I would come to after a long day of work and play to relax in the amazing Kohler soaking tub, but I could have never guessed my kids would love this bathtub even more than I do! 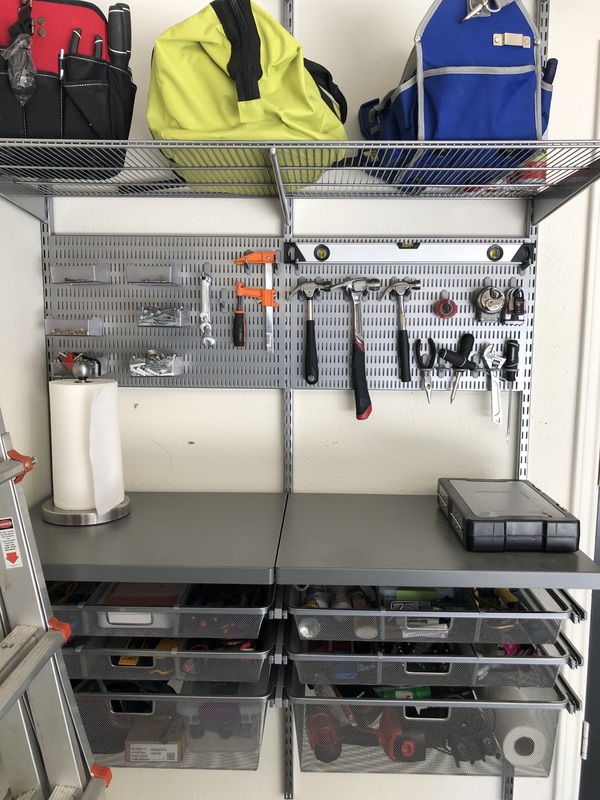 It’s so fun (and helpful!) that they can play in the space while I get ready. 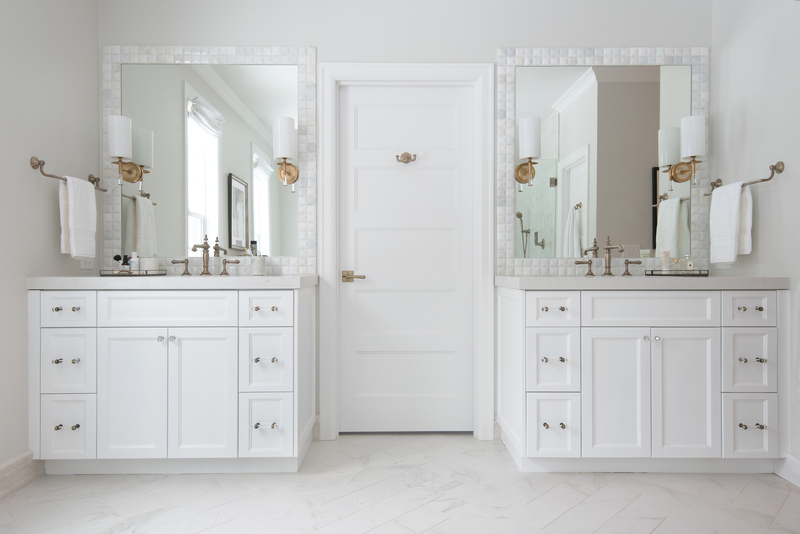 I kept the look more clean and classic in the master bath with an all-white palette, but kept the theme of pattern with the herringbone floor in a beautiful porcelain marble. When we shared this photo on Instagram a couple weeks ago we could’ve never guessed just how much you all would love it! 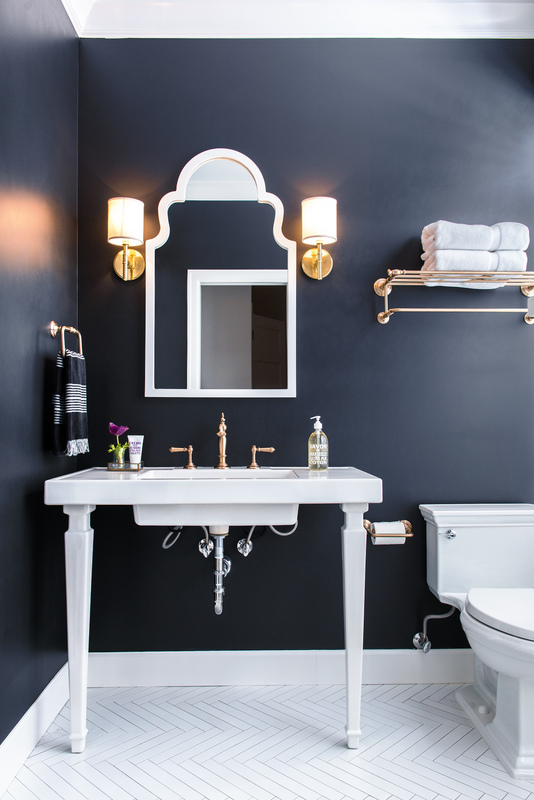 Nancy at The Decor Detective did an amazing job renovating this sweet powder bath. 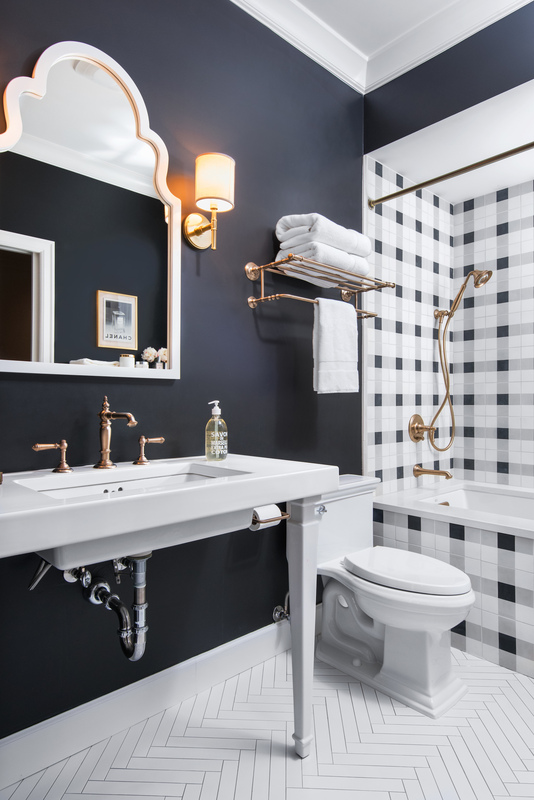 We can’t get enough of its high contrast details, that gorgeous mirror and of course, our Navy Spotted Wallpaper. 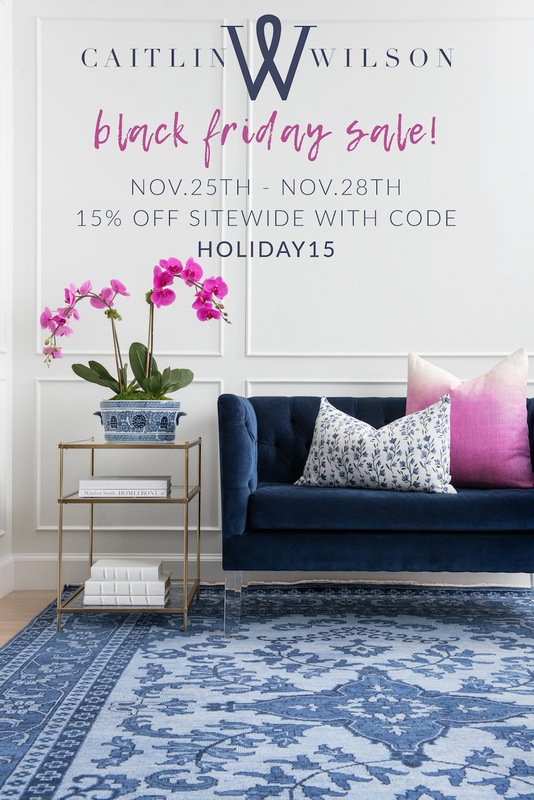 Scroll to the bottom of the post for details on all the sources! 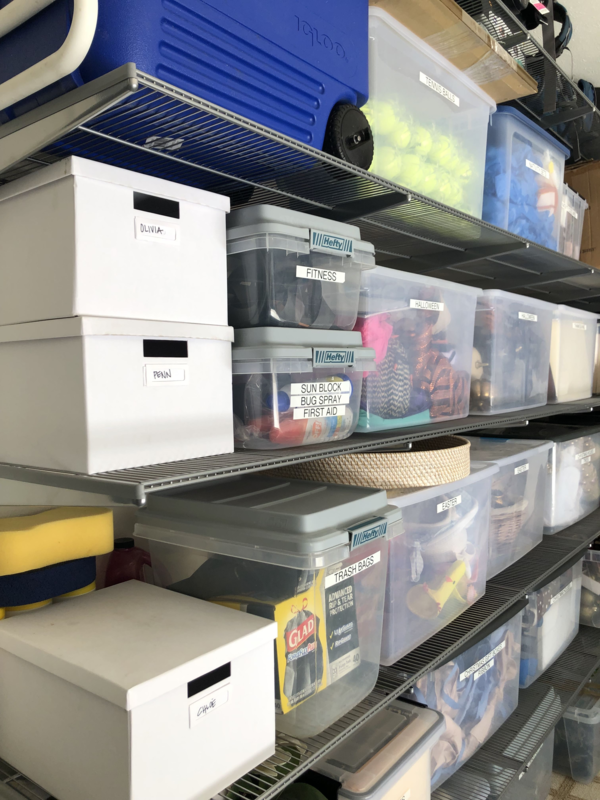 And for before and afters, head to Nancy’s blog.